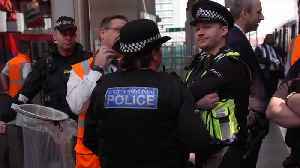 Climate change activists from group Extinction Rebellion are removed and arrested by specialist police teams this afternoon (April 17). 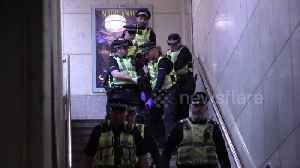 Climate change activists from group Extinction Rebellion are removed and arrested by specialist police teams this afternoon (April 17). 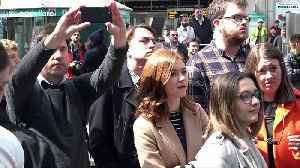 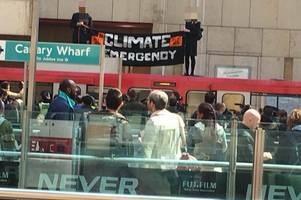 The group stopped trains on the Docklands Light Railway at..
Environmental activists climbed onto the roof and glued themselves to a train in London&apos;s Canary Wharf financial district on Wednesday as part of a third day of action to force Britain to take.. 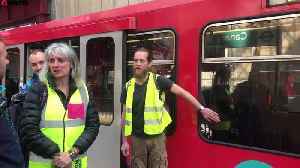 Protesters from the environmental group caused disruption at Canary Wharf by climbing a DLR train and gluing themselves to it. 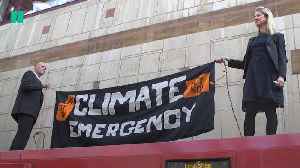 Extinction Rebellion have been carrying out protests around the capital..